Our Collaborative Graduate Program in Design consists of coursework and graduate degree research. The coursework includes general design courses, domain design courses, and leadership development programs. The general design courses are: 1. Abstract Design Theory—which allows students to discuss what design is; 2. General Design Theory—which explores the basis of cross-disciplinary design, including design of artifacts, markets, organizations, communities, and information; and 3. General Design Method—which covers tools that support cross-disciplinary design, such as ethnography, data analysis, modeling, and simulation. All courses are newly offered in this program and incorporate teaching techniques aimed at providing students with a wide variety of interpretations rooted in diverse perspectives, such as a collaborative lecture system where professors from different faculties lecture in the same class. The domain design courses consist of five specialized disciplines: informatics, mechanical engineering, architecture, management, and psychology. The courses are selected from existing courses in each domain and are reorganized with new elements added to form the foundation of design for each area. These courses may be taken as either a major or a minor, since they do not follow the established learning track of each specialized discipline, and instead focus on how each discipline contributes to design. For example, the domain design courses in informatics consist of subjects such as: 1. Informatics as a Design Tool—which supports data analysis; 2. Informatics as a Design Principle—which examines optimization and control theory contributing to the formation of social system models; and 3. Informatics as Design Experience—which focuses on how smart phones and SNS contribute to innovation. Students can freely select subjects that match their study purposes. The leadership development programs include: Overseas Research Internships, Field Internships, and Strategic Communication Seminars, all of which allow students to foster their international and practical research skills. The Overseas Research Internships are already being run by all participating departments, which have pooled together their experiences and expertise in providing pre-/post-internship training. The Field Internships, which represent our first attempt to exploit the power of field education, send teams of students from various specialties to work together in the field for several months. These internships aim to build leadership skills through group activities, unlike traditional research internships where only one individual plays the central role. 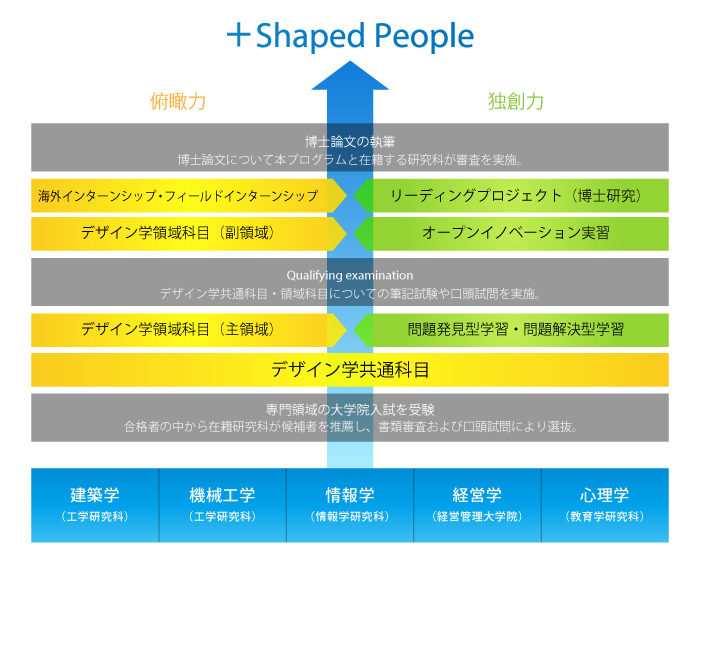 Although this new endeavor has not been put into full swing yet, we have already completed many preparations, including the publication of a textbook called “Field Informatics” in both Japanese and English. The Strategic Communication Seminars are short-term English and Japanese courses that enhance communication skills. The English course, which was established with the cooperation of Berlitz Japan, Inc., aims to improve English presentation and speaking skills with rich content provided by Berlitz. The Japanese course was jointly developed with NHK-Communications Training Institute, and is led by NHK’s executive TV anchors, who train skills in speaking, negotiation and reporting. The other half of our program—graduate degree research—is founded on the aspiration to identify and solve real-world problems. Master’s and doctoral research is conducted under the supervision of a multidisciplinary advisory committee. Doctoral research in particular entails collaboration in leading projects that address a real-world challenge (joint research laboratories, academia-industry-government-public-citizen projects, and emerging projects) and demands a high level of specialization. As the groundwork for this research, students take two types of courses: Field-based Learning, which involves identifying social problems or social expectations, and Problem-based Learning, in which students try to discover solutions to problems by themselves. In both cases, teams are formed by students from different disciplines. Half of the training topics are real-world problems that faculty members are researching, such as dissemination of renewable energy and redesign of urban areas, while the other half are challenges raised by companies, local governments, non-governmental organizations, or communities. The student teams endeavor to resolve these problems based on collaboration with the individuals or groups that raised them. Furthermore, students undergo an Open Innovation Practice that gives them hands-on experience in identifying and solving real-world problems. Specifically, they build a team of experts or stakeholders for open innovation, and hold a series of workshops in order to achieve their goal. The role of the students is not to simply be a specialist participating in the discovery or resolution of problem, but to form a professional team and manage the open innovation process. Through this experience, students can enhance their communication and management skills, understand design theories, and master design methods for successful design activities. As a high-quality 5-year degree education based on an active dialogue with professors and professionals from the university and outside and an industry-government-academia cooperation, this program is designed to develop internationalized human resources who can exercise leadership over the solution of the issues on designing social systems and social architectures with a distinguished global view on different fields of expertise and a prominent creative problem-solving stance. Fostering human resources with a broad-based knowledge and a specific expertise, combined with flexible thinking, determination and the ability to take action, ready to lead in every area of society, is one of the missions of Kyoto University, and an essential requirement in all areas of society, including industry, government and academia. exhibit knowledge of advances and developments of design in their domains either of informatics, mechanical engineering, architecture, management or psychology as well as demonstrate knowledge of research in related fields and disciplines other than their own domain field. comprehend and effectively employ appropriate design methodologies for solving complicated problems based on a broad awareness and knowledge learned from trans-disciplinary fields. develop and maintain effective relationships with colleagues working in a collaborative environment that are cultivated through engagements in the courses of PBL (Problem Based Learning) and/or FBL (Field-Based Learning), and through doing research internship and field internship. advance knowledge through original research of Ph.D. work proactively reacting to newly identified needs and aiming to resolve real complex problems of the society and understanding the potential impact of research on the issues of designing social systems and social architectures. effectively use and decide on appropriate forms and levels of communication and exercise leadership over the solution of the global and inter-disciplinary issues. This program will welcome able young students who are operating in an independent and self-directed manner, showing initiative to accomplish clearly defined goals of design and understanding the relevance of research in society and the potential impact of research on real society. Candidates to this program are selected among the students enrolled in the graduate schools and departments listed in Table 1 below in April of the recruitment fiscal year. Students who were enrolled in the Master’s program at the Graduate School of Informatics in October of the previous fiscal year are also eligible for this program. Nationality, gender and age are no object. After enrollment in their respective graduate schools, students (40 of them) are first recruited in April for five-month Preparatory Course from May to September in principle, as program candidates. The students will be selected among the program candidates to officially start the program as program students from October as a general rule. Under the curriculum of the program, students will learn from 1) General Design Courses, 2) Domain Design Courses (major and minor), 3) Practice in Design Courses of Field Based Learning (FBL) and Problem Based Learning (PBL), etc. 4) Leadership Development Courses of Research internship, Field internship and Strategic Communication seminar. In this program, at the end of the first part of the program (the end of the 2nd year), students are evaluated (Basic Doctoral Ability Qualification, meaning Qualifying Examination abbreviated as QE hereafter) to ensure that they have acquired a comprehensive academic knowledge through the coursework that is sufficient for beginning the second stage of the doctoral program. The expected period of completion of the first part to pass QE is two years. A part of the compulsory courses needed to complete the first part of the program are open to the society domestically and internationally, where students are expected to learn under cross-cultural and multilingual environments. An academic assessment on the learning outcome for General Design Courses and Domain Design Courses will be done based on the grades of the written and the oral exams. Assessments for minor Domain Design Courses are not included in the scope of evaluation by QE. Those courses are to be taken during the total five-year program period. After passing QE, students begin their doctoral work as well as take minor Domain Design Courses and Leadership Development Courses. Moreover, through the field internship and the research internship, they develop their international and practical senses of research. In this way, doctoral graduates with a broad-based knowledge and a specific expertise are fostered. Doctoral works are done under supervision by multiple advisors from multi-disciplinary perspectives. Doctoral thesis undergoes an assessment with respect to its academic contribution as well as to the attainments of design researches contributing to solving the real problems of the society. Certifications of research guidance will be done annually at the end of the academic year by students’ schools being approved by Kyoto University Leading Graduate Program Governing Board. Since no doctoral program exists in Graduate School of Management, students of Graduate School of Management is required to be enrolled in either of Graduate Schools of Informatics, Engineering, or Education after completing the first part of the program. In order to complete the program, students are expected to acquire the knowledge and aptitudes necessary to exercise leadership over the solution of the issues on designing social systems and social architectures with a distinguished global view on different fields of expertise and a prominent creative problem-solving stance, as well as the experiences and aptitudes necessary to demonstrate strong communication skills and a career in an international setting. This program requires students to complete the designated courses and meet the credits requirements in line with the curriculum policy of the program, the submission of Doctoral thesis within the designated period, passing of all the corresponding qualifications and examinations required by the program and also passing of the final qualification by Kyoto University Leading Graduate Program Governing Board. Academic degrees to be gained by students in this program are as follows; a Doctorate degree (Ph.D.) in recognition of the completion of the Doctorate Program of Graduate School of Informatics, a Doctor of Engineering in recognition of the completion of the Doctorate Program of Graduate School of Engineering, or a Ph.D. in Education in recognition of the completion of the Doctorate Program of Graduate School of Education. 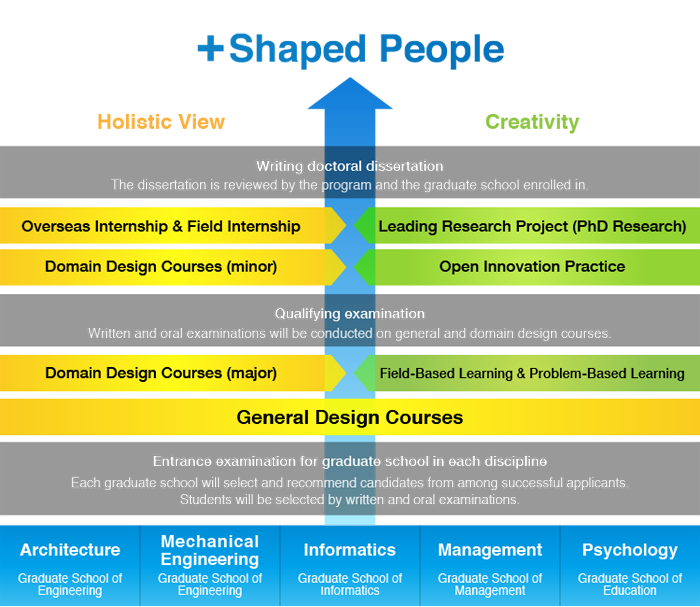 As for the latter two Doctorate degrees of Engineering and Education, certification of the completion of the Program for Leading Graduate Schools ‘Collaborative Graduate Program in Design’ is specified in the diploma. The first stage of this program requires students to complete the designated courses and meet the credits requirements in line with the curriculum policy of the program, the submission of Master’s thesis (if it is required) within the designated period, passing of all the corresponding qualifications and examinations　required by their affiliated schools as well as passing QE.